Most people reading this article has life cover with one or the other life insurance company. My question today is, how did you determine how much this cover should be and do you understand the implication of your life insurance decisions on your long term planning? It is important that your financial plan or provisions should be relevant, i.e. are you insured for the right amounts, are you saving enough for retirement etc. Where we see a lot of plans going astray, is with the long term sustainability of the plan itself. I suspect this is not entirely disconnected to the fact that the person selling the products, more often than not, does not have any inclination to be around by the time the plan becomes unsustainable. One of these problem areas is life cover. This concept has been bugging me for a while now. I noticed over the years that very few 70-year olds have any life cover in place anymore. On the other hand, I know for a fact that all of them at some stage had life insurance with the intention of keeping it for whole of life. Most people today will also tell you that they plan on keeping their life cover intact for their children to benefit from it one day and will only cancel the cover if they can’t afford it anymore. Somewhere along the line, this outlook therefore had to change and as we know, deviating from a plan normally costs money. And when people change their minds and stop their life insurance, what happens to all the unclaimed premiums? Can it be that the insurance companies figured out that sustainability of life premiums after retirement would pose a big problem for most, and that at some point the liability would fall off the books, handing them very nice profits? Let me start at the beginning and try to explain why I feel that most people might be incorrectly insured and why they may be misappropriating their hard-earned money and why this might be the case for you too? When you sit down with your planner, talking about life insurance, the questions normally go something like this: “What are your assets and liabilities and how much, on a monthly basis, does the longest living spouse (and the rest of the family) need from an outside source if the insured life dies?” To determine the amount of liabilities that need to be paid off at death is easy, but determining the amount of money needed to supply the spouse with an appropriate escalating income for life is a whole different matter. When the spouse is not present at this conversation, the amount that is mentioned as sufficient is normally quite a bit less than what it is when she is at the meeting. First tip therefore is, ladies, be sure to be present when your husband sees your financial planner. The same goes for the husband of course where the household income roles are reversed. After these figures have been punched into a computer program, which normally uses normal life expectancy tables where you only get to live to about 82, an amount of required cover is generated and a quote is given (normally at standard premium pattern) to satisfy this need. Now here lies the problem; Even if this number is correct, this calculation will only be correct for the period immediately following your meeting. This calculation has to be done every year and theoretically, your cover has to be adjusted every year or two (up or down). 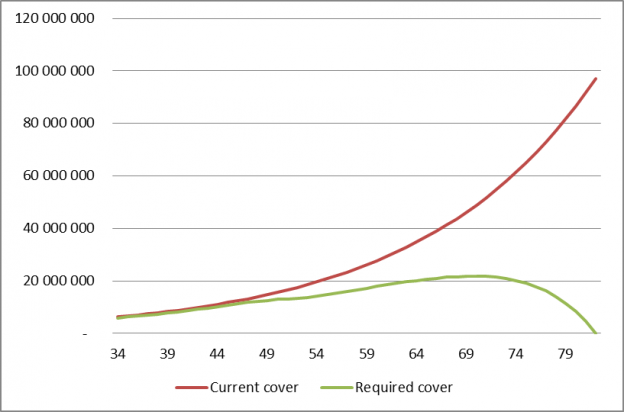 Do you re-calculate your required cover at least every 2 years? When is the last time that you have done this? As I will indicate in my example, these numbers that we get to, can be far removed from the true requirement. If this is the case, the implications for your family could be severe. Their current lifestyle is being used to calculate future income requirements. The model does not allow for how Jane’s life would have been, had Tim not passed away, and the annual escalation of 6% in income might be lower than what her real rise in living expenses is. Because of the fact that the calculation is done over a 48-year period it is very sensitive for any mistakes in the assumptions. If for example the real inflation rate is 7%, and the return on invested funds is only 10%, the surplus of R400 000 changes into a shortfall of R2.2million. If Jane lives to 92, the shortfall increases to almost R3 million. Is the assumption of R25 000 pm realistic? If the actual requirement is R30 000 we have a R700 000 shortfall instead of a R400 000 surplus. The next problem with this way of planning is how the need for life insurance and provision diverge over time. If we assume that the amount of cover required is indeed equal to what his provision currently is, Tim would still have to start reducing his cover from about age 48 if he doesn’t want to misallocate premiums. This is because the profile of required cover increases slowly, levels out at about 10 years before the end of his life expectancy, and then reduces to zero towards the end of your life while the cover and premiums will just keep increasing. 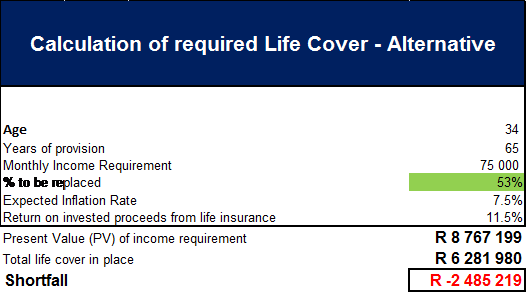 When you are AT the “required” cover, even you can imagine that life cover of R20million for someone of 65 will cost a fortune. This is why we don’t see a lot of 65-year or 70-year olds with any life cover, what more to say R20million worth of. I believe that a more sensible way of looking at life cover, is to look at the income generator as an asset and try to determine “its” value and insure that asset. When I look at the Wikipedia definition of insurance it correlates with this view. 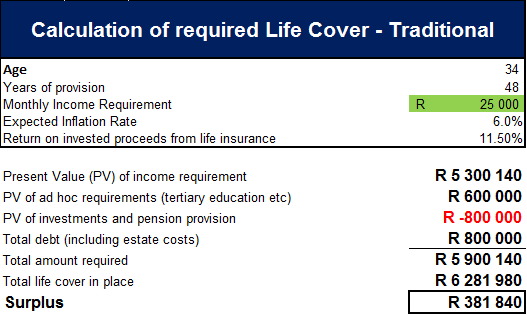 This “transfer of risk of loss” is the transfer via the life policy to the life insurer. The “uncertain loss” is the loss of Tim’s income, and by calculating a present value of his potential lost income, we can put a value on it. If we then take his gross pay of R75 000pm as our starting point, we adjust for things like tax of 40% and contributions to a pension fund that wouldn’t have to be paid anymore, we can come to some estimation of the net loss of income. See example below. Contrary to the traditional calculation, Tim has a shortfall of R2.5million. This is a difference in outcome of almost R2.9million and will have a significant impact on the family’s quality of life after Tim’s untimely demise. If my logic about the real risk of loss is correct, then Tim is currently under insured by about 28% instead of being over insured. His actual income is being used rather than some sort of subjective guestimate of what Jane and the kids would need. We take future potential increase in salary into consideration (7.5%) instead of the official inflation rate (6%), which will probably be a more realistic picture of Jane’s increase in costs too. We consider that he would retire at 65 and his economic value to the family would drop to zero at this point, since he won’t bring home any more paychecks. See definition of insurance again. The “risk of loss” initially increases, then plateau’s and then reduces over the final 10 years of your working life. If Tim and Jane realise over time that they will retire earlier the calculation would just be adjusted to 60 for example. This would immediately reduce the life cover required. With the traditional way of calculating, the amount is always linked to your life expectancy and it doesn’t take into consideration the insured life’s “asset value”. 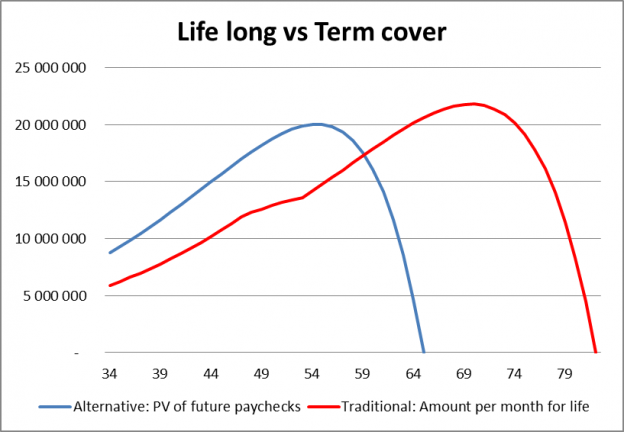 When we plot these two different approaches to calculating the life cover requirement on a graph, it makes for interesting reading. The blue line on the graph (next page) represents what I think Tim’s life cover provision over the next couple of years SHOULD look like, while the red line would be the answer we would get to if we used the traditional method. What should be obvious from the above is that Tim will be under insured for the period until he is about 59 (with the first 15 years being the most crucial), while he would be significantly over insured after about the age of 59. The problem with being under insured is that, if the undesired event of Tim’s untimely death DOES transpire, there is no way of correcting this mistake after the fact. The shortfall Jane is going to have will be a proverbial line in the sand that she will have to live with for the rest of her life. My view of insurance is that its sole purpose is to insure against the loss of an asset (think insurance on your car). I cannot see why we should deviate from this definition the moment we talk about life insurance. If you feel the same, a couple of compelling arguments come to the fore. The asset in question is the insured life’s ability to generate an income (through his/her labour). This asset’s value initially increases, levels off later and then starts to decline as you near retirement (or the end of your income generation). The day you retire, your worth as an income generator becomes zero and your life cover is obsolete from an insurance perspective. In other words: If Tim and Jane retire and Tim still has life cover, but they start living off their retirement funds, Jane will be better off financially if Tim “kicks the bucket” as she would now have all the money they saved for retirement as well as his life cover. Tim is therefore more worth dead than alive…..never a good proposition. In many people’s case this becomes a reality shortly before retirement when the husband realises that they will never be able to survive financially or he loses his job in his late 50’s. He then looks at his life cover and decides that “falling on his own sword” is the best thing for his family. When this happens it constitutes a complete failure in the planning process. You should NEVER be worth more dead than alive. Because Tim only has to plan until retirement date (21 years instead of 48) the impact of incorrect assumptions is MUCH smaller and the margin of error in the planning is therefore much smaller. Because you only have to plan for a term (until retirement) instead of whole of life you can utilise compulsory premium patterns. This allows you to afford much more cover than you would be able to using regular premium patterns. You can therefore afford to insure your life for the correct amount due to better affordability. In closure just the following final thoughts that you should consider when thinking about your own life insurance provisions. Life insurance is not a big priority where there is little debt, no dependants and both parties are strong earners or income is of a passive nature. Where kids are involved, or where income is not passively earned, and especially where there is a big disparity in earnings between husband and wife significant cover is usually required. Decide on a strategy (traditional vs alternative) early and stick to it. There is a perverted tendency of people to view life cover as an investment for the descendants. I don’t share this view for various reasons but most of all, the calculations indicate that it isn’t a long term investment. 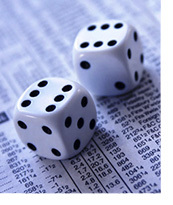 To view life cover as an investment is similar to viewing spending money at the casino as an investment. The only thing is at the casino you don’t have to die to win. I would much rather view life cover as it should be viewed, as INSURANCE against an unforeseen and unwanted event. If you do want to keep your life cover for whole of life you better make a 100% sure that you will be able to pay the premiums until the end. Life insurance premiums escalate disproportionately to cover which causes you to pay more for ever and ever decreasing real return. The only place where this is not applicable is where you have level cover and level premiums. If your cover therefore escalates by inflation your premium will increase by 10% or more (on a standard premium pattern). If you are on an age rated premium pattern these escalations will be higher (anything from 12% to more than 20% per year). These premiums become unaffordable and pose a real threat to the sustainability of your plan. If you plan to keep life cover for whole of life (even if it is until the age of 95), I want to seriously encourage you to look at something like Discovery’s paid-up benefit (as far as I know the only company offering such a benefit). With this product your premiums stop at age 65 and no more premiums are payable while your cover at that point stays intact. Over time (if you reach a very old age) the real value of the cover would drop considerably but at least you would’ve locked in the benefit and wouldn’t have to worry that the premiums will become unaffordable AFTER retirement. Ask your adviser to re-calculate your actual cover requirement regularly if he/she is not doing it already and make the necessary adjustments when actual cover deviates significantly (more than R500 000) from the calculated amount. If you are within 10 years from retirement, your required cover has already started to decline. Think about starting to phase it out and rather add the saving in premium to your retirement savings. It will serve you better in the long run. This might sound absurd but if you are the main bread winner and your spouse has been tasked with giving up a career to raise the children, no or very little cover is almost better than being significantly under insured. I have seen in more than one instance how a little cover gives the widow a false sense of security. They put off going back to work thinking that the money will last, only for this money to run out when they are deep in their 50’s or 10 years or longer out of the job market. They then find themselves in a very tight spot of not having nearly enough money but also finding it extremely hard to find work that pays any kind of decent income. What was supposed to be their golden years then turns into a nightmare. When there is no money they are shocked right back into action. If you are a spouse in this situation, you will do well to make sure that you will be okay if something happens to your husband. Let me stop here. Even the most loyal reader of this newsletter will probably be asleep by now. It is strange how this topic will not interest anyone who hasn’t been affected by incorrect provisions and how most people, even after reading this, would still not go through the trouble of understanding their own position. When something bad happens, this subject gets right up in your face though. The sad thing is just that there is very little remedial action that I or any other financial planner can take at this point. Please do not make this mistake. Get to someone who can do the proper analysis for you, think rationally and make proper recommendations to you in this regard.